Hard as it may be for us to grasp from our vantage point in the 21st century, in the 1950s and early 60s atomic weaponry was cool. Sure this was due, in part, to our arch-enemies of the time -- "da' Commies" -- having A-bombs and H-bombs of their own, which our nuclear bombs would surely protect us from. Somehow. 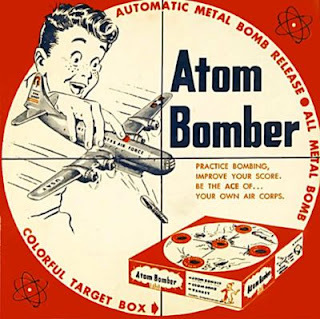 But more than that, people generally thought of atomic energy as the doorway to a wonderous new future, despite its being so good at blowing things up. Everything was going to be nuclear powered in days to come, even the family car. As a kid I lived down the road from Arco, Idaho and many a time drove past the sign at the city limits boasting that they were "the first atomic powered city!" It wasn't just the atom's potential to generate energy, though. Under "Operation Plowshare" (you know, "They shall beat their swords into plowshares..."), H-bomb explosions were tested for excavating new harbors, mining, stimulating the flow of natural gas, widening the Panama Canal or building a new canal through Nicaragua. Click here for a list of all the blasts and the many projects that were planned. The atom was magic! Back then Americans liked Ike and tended to trust the government, including its custodianship of our nuclear energy in all its forms. We got comfortable with the atom and looked forward to the future it promised. We even bought our kids uranium to play with! All of which may help to explain why these five guys and a cameraman volunteered (except for the cameraman) to stand directly under a small nuclear explosion to see what would happen. They apparently survived but according to this Atlas Obscura article, no one knows what became of them.